There are benefits to having your site more secure. Google has said it will reward you as a factor in your search rankings by using an SSL certificate for your website. It will also remove the current browser warnings that are popping up removing concern from your users. SSL (Secure Sockets Layer) is the standard security technology for establishing an encrypted link between a web server and a browser. This link ensures that all data passed between the web server and browsers remain private and integral. SSL is an industry standard and is used by millions of websites in the protection of their online transactions with their customers. To be able to create an SSL connection a web server requires an SSL Certificate. When you choose to activate SSL on your website you will be prompted to complete several questions about the identity of your website and your company (REM will handle this). This is what ultimately puts an https:// in front of your website address. If you would like to move forward, REM can handle purchasing and installing the certificate for your website. Please let us know if you would like to proceed and we can take care of setting it up for you. Thank you for supporting REM in the past year! Click here to play our custom built game. Thank you to all the REM staff for their hard work building the game in time for the holiday season. For each person that plays, REM will donate $1 to Sick Kids Foundation. We often don't take the time to tell people how proud we are of them so I wanted to take the chance to tell everyone what an amazing team we have at REM. We have been working really hard this year to deliver exceptional design work, great new tools to manage your website and superior customer support for our customers. I am so proud of our team in all of their accomplishments but I wanted to highlight a few. Everyone at REM works hard each day for our clients to come up with custom designed websites that not only look great but are designed to engage their target audience. Our team has been chosen for the 2019 Consumer Choice Award in Web Design for Waterloo Region. Award winners are the result of a in-depth, consumer evaluation process. It involves the gathering of unbiased consumer opinions, calculated and vetted by some of North America’s leading market research firms. I am also extremely proud that we have exceeded 50, Five Star Reviews on Google this year. This is also a proud accomplishment for everyone at REM. We all work hard for our customers to live up to our #1 Guiding Principle which is Customer Success Comes First..
Have a look at the most recent reviews from our customers. "It was a pleasure working with REM Solutions to redevelop my business website! They were patient, comprehensive and genuine about understanding my business needs and how to best represent that on my new site. I continue to appreciate the great customer service they have to answer all my questions as new web design ideas pop into my head! I would definitely recommend them for any non-techies out there looking for a new or refreshed website." "Excellent group to work with, friendly, very responsive, and full of helpful advice. The design of our new site came out looking great and we are very pleased with the added features and the ability to manage our content through their WebWiz@rd CMS. Would recommend." "REM helped us to design a website that worked for us! They were great to deal with throughout the whole process. The team we worked with was extremely professional, supportive and always quick to respond. We had a fantastic experience!" What I love the most about these comments is the common theme about how great our team is at what they do and how supportive they are of our customers. When I meet with people, I tell them all the time that we are not the only ones who can offer them a great website. What I do know is we offer the best support for our customers not just during a project but throughout the relationship. At REM, we take disaster recovery and backup very seriously. We take great pride in the reputation we have built for reliable and safe hosting of our customers' information. Disasters come in many forms and require different strategies to combat. REM has implemented various safeguards and procedures to keep all of our assets and all of our customer assets safe. We keep our production computer equipment in an access controlled data centre that is climate controlled, has redundant power supplies and multiple network feeds to virtually eliminate infrastructure downtime. We continue the infrastructure safe guards by maintaining duplicate servers for all of our critical components that can be switched on in the event of an individual server failures. We understand the importance of backups, but we understand that recovery trumps the importance of backups. To that end, we perform multiple fire-drill style recovery exercises that put all hands-on deck to prove that REM’s various backups– do in fact – work in a recovery scenario. We understand that “anything can happen” but we do our absolute best to make sure those options are limited and mitigated. I hope everyone had a great holiday season. 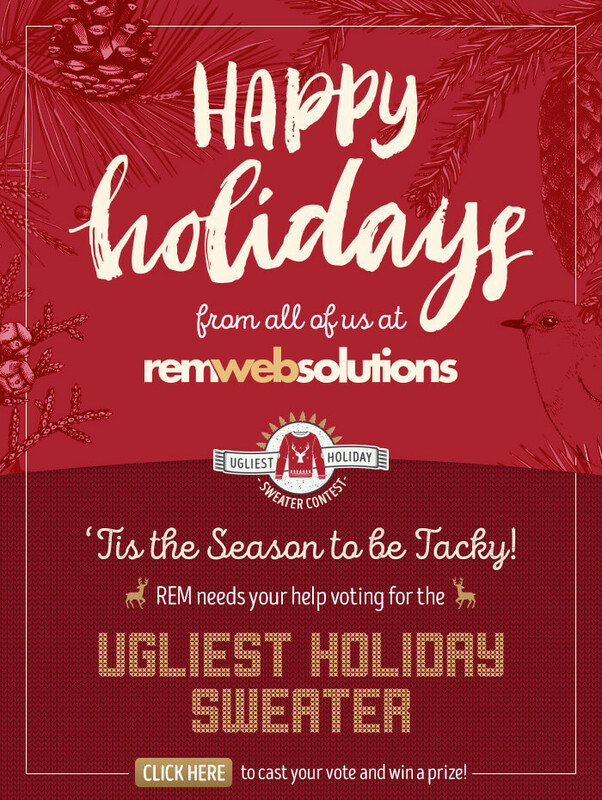 We had a lot of great feedback on our Holiday Sweater Contest this year and appreciate the time everyone tool to vote. We had over 150 votes and the clear winner was Todd. Todd had approximately 50% of the votes. We would like to congratulate Nicole from MTE as the winner of a $50 Vincenzo's gift card. We are already starting to think what we can do for next year! It was a fun creative contest and I particularly enjoyed the audience participation! Well done REM! This is a continuation from part one that talked about the creative brief process in our designs. After our design team, has reviewed the creative brief with our design team the begin the design process. In a matter of days, the graphic designer provides an exciting look at the website concept and solicits early feedback from our clients. This early feedback is unique to our process and is instrumental in designing the perfect website. This feedback loop is repeated up to 4 more times. To state it concisely, we allow up to 5 rounds of revisions per project. That’s more than any competitor we’re aware of. We really want to make sure you love it before we build it! Once a concept is approved by the client, the design files get send to our development team where all of the powerful WebWiz@rd components are attached by a dedicated developer. Every part of the project is tested during implementation by the developer and then double checked by your account manager. A final check is performed between the completed product and the original agreement. Once complete, the beautiful new website is held on our staging server and presented to our customer. We call it a tour. In conjunction with the tour, our technical support team will invite the entire client team in for training. Training is designed to quickly demonstrate how the new tools work and to make it easy for our clients to make their own content changes in the future. The new website remains on the staging server until the customer is ready show it to the world. While on the staging server, the customer is free to modify their content, add new pages, transfer existing content from other sites, all while keeping their existing site up and running.